Stretch your calf, Achilles, back chain stretch – Just how simple can it be? Many runners suffer calf, achillies, hamstring and other ‘back chain’ symptoms. 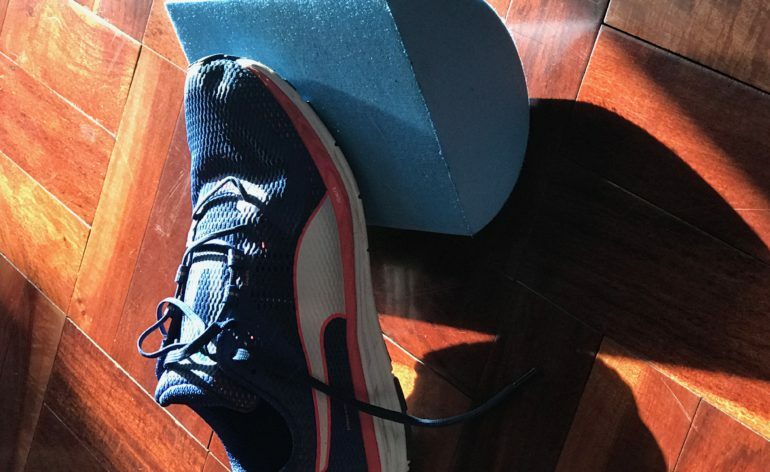 Irrespective of cause we would want to be able to stretch these muscles and soft tissue and the half round foam is a great solution, not only because it gives a great stretch through the rotation of the foot, but it is also small, lightweight, easily obtained, and easy to carry even in the most severe / hectic of travel situations. In addition this half roller has the ability to be used for proprioception training which is the means by which the brain / neural system becomes aware of where bones, body and muscle is aware of it relative location compared to other parts of the body. Improving proprioception in foot landing not only means reduced forces in left and right direction – which means reduced foot contact on the ground and hence more contacts per minute and hence faster running speed, BUT ALSO means reduced risk of tripping or better balance in awkward footing situations. This becomes particularly important to elderly people, as statistics in USA and UK suggest that many elderly people will trip on the smallest of stones, fall and fracture their hips, be off normal exercise while the hip is repaired or replaced and then suffer from septicaemia and this becomes fatal. Stats in America suggest this can be the cause of 20% of death in elderly people and in performance terms is a major part of the work and efficient running in sprinters. Minimizing the energy used to keep the foot from using lateral forces means there are more forces available to drive forward and that means time and strength.